Melbourne Lifestyle Blog: A sweet trip to Adelaide, starting with dinner at Kenji. A sweet trip to Adelaide, starting with dinner at Kenji. If my life revolved around food, which at times it does, then I would consider moving to Adelaide. My friend warns me that I have been spoilt for choice. By this she doesn’t mean there are many options, but that the ones chosen for me are always good. “There are many bad restaurants in Adelaide too,” she warns. So far, I have not seen them. So I am not moving to Adelaide, but last week I did enjoy a quick trip with as many meals crammed in as possible. The eating started on a high note with my godmother choosing Kenji for dinner. Perhaps I was sceptical when she suggested it was Japanese, but I am glad I trusted her food expertise. Arriving straight from the airport on a Wednesday night, it was already full – but peaceful with soft lighting and furnishings to absorb the acoustics. Everyone was very excited about the meal as we read through the menu. To whet our already rumbling appetites we enjoyed the spiced olives. They were sweet with orange and spices (cardamom, star anise and many different flavours I would have never expected olives to contain). 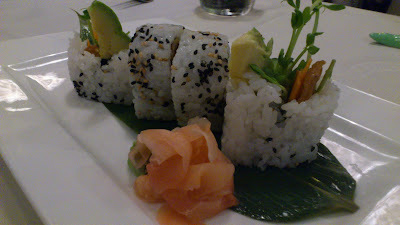 For entrée we shared vegetarian sushi rolls. The rice was soft and fresh, the seaweed crisp. 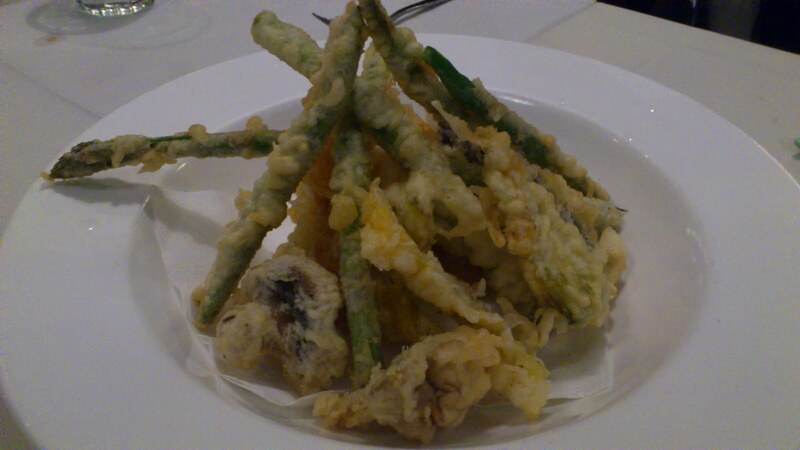 The vegetable tempura was light and delectable. I was brought vegetarian dipping sauce – they assumed (without asking) that I was vegetarian because of my main choice. The mains took a while to arrive, a downside to the chef’s perfectionism. The ‘vegetarian main’ typified fusion cuisine: taleggio, mushrooms, ankake sauce, daikon, Asian greens. 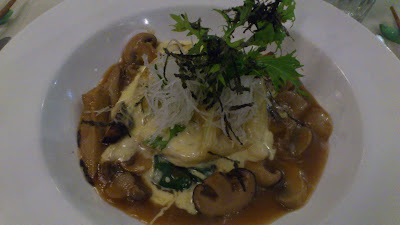 Reading the description I was not enticed, but it was the most delicious and innovative dish I had eaten in a long time. Somehow the saltiness of the cheese and the sweetness of the Japanese sauce complemented each other into a sensational, more-ish taste. The pasta was al dente. The radish was fresh and shredded. I wanted to lick my bowl clean. The meal was made only more exciting by the bottle of 1979 Chateau Montrose that my godmother brought. The waitress recognised it, explaining she’d visited when she was in France and expertly decanted it before rinsing out the bottle to keep. 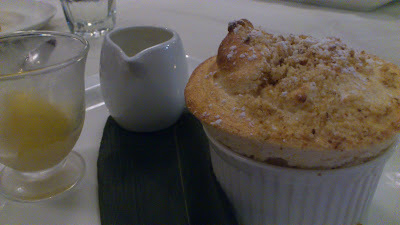 We could not miss dessert and I was pleased to order the cumquat soufflé. It came perfectly risen with remnants of tangy cumquat juice at the bottom. The top was encrusted with walnuts. To accompany was a soft mango sorbet with citrus and what seemed to be sweetened condensed milk at the base. As a table of hungry food lovers, we chatted about food almost the whole time – creating a list of other places to visit during my 24 hour stay in the westward capital.